Had a crabby day at work today, so I commiserated with a fellow curmudgeon. I've stepped away from the finer beers of late, substituting pound-able but passable basketball-watching suds instead. I'm also going through this phase where I'm overly possessed with proving to myself that I can go a night or two or three without a beer, and my tasting and rating has suffered immensely. Sadly, one of the only new beers I've tried in the last couple weeks was a Heineken Light. I guess I didn't taste much of a difference. Anyway, this experiment has had a couple side effects. I feel fine on those nights I choose (practically force myself) not to enjoy a brew or two, and know I can do it. Stage one of alcoholism passed swimmingly. However, once I've tallied a few days of sobriety, I cut loose. For example, this past Friday was a forgettable and largely forgotten binge of garbage calories that led to a stone sober Saturday, which nobody wants. With that said, I feel great during the week. There's a void when it comes to finding a sense of accomplishment or achievement at work, so the sobriety, I guess, substitutes. Am I doing this for health reasons? To slow the inevitable sinking of the gut? Or am I out to prove to myself that I still have willpower--that I can ignore the 30 delectable treats staring at me each day I come home? And if I'm flushing it all away when I am satisfied with the fasting, was the fasting worth it? I go back and forth, but right now, I'm back to where I feel I can treat myself nightly, and plan on starting tonight with this Founders. I've a brain that rarely powers down, but this Curmudgeon should help. The appearance is akin to the most pleasing barleywines; ruby turning to magenta to caramel. Not much head, and none of it lasts. When I swirl the glass, it rocks like a relaxes quickly, and doesn't seem like it will coat my mouth so that dinner winds up with a curmudgeonly aftertaste. It's a bully of a sniffer. I dove in a half dozen times and each time found another layer. It's geekily layered; a Sufjan Stevens tune and a David Lynch flick. (Side note: you see what happens when I realize I'm no good at picking out specifics in a beer. I resort to wild metaphors and pointless side notes.) I'll try. There's brandy. Port wine. Obvious alcohol presence indeed. Sweet, intensely sweet, and more than just the clumped-together dark fruits and caramel. It smells stiff and warm, but has the life that a big stout might not. I hoped the taste would recall memories of Bell's Third Coast Old Ale, and it does. It's just a beauty of a beer. Barleywine-ish? 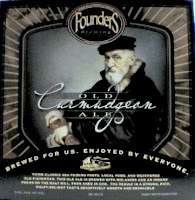 Yes, but this Old Ale business makes it sound so much more majestic and regal. The caramel (word of the review) stick is there, and it gets better as the beer gets warmer. Beer drinking for dummies advice of the day: let the beer warm. Drinking a beer at different temperatures is revealing and rewarding. There's the alcoholic surge that must exist in a nearly 10% beer, but it's delicately disguised. I feel it, know it's there, but can't find it. It passes the chug test, too. Drinking this one sip to sip is great, but a giant swallow doesn't overwhelm. So easy to drink, this one. I planned on it lasting me through dinner, and it would serve as a wonderful dessert drink, but I don't think it will make it to either. Luckily, I've got a Fuller's Vintage I think I might pop tonight as well. Not sure what it is about this old ales; it's the combination of potency, drinkability and mystique that has me ball and chain. This one is dragging me.